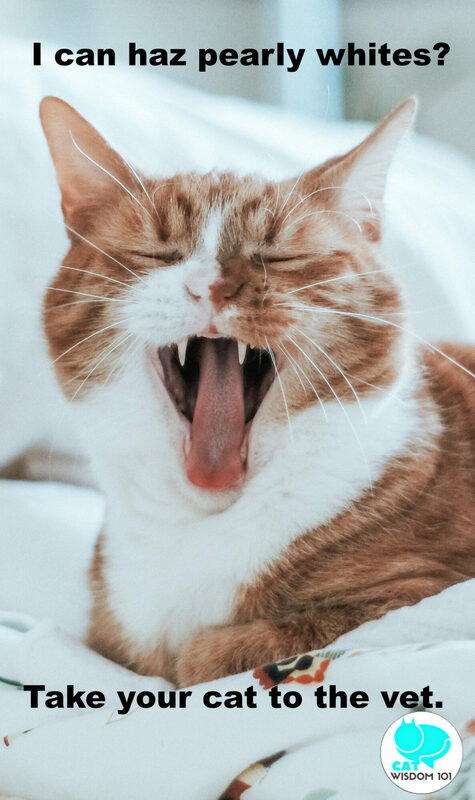 In honor of Pet Dental Health Month, we have a reader Q & A with Dr. Rich Goldstein DVM (updated Feb. 2019). Question: Chips, my ten-year-old male tabby has a heart murmur and our vet is hesitating to anesthetize him for a dental cleaning. He has quite a lot of tartar and redness along the gums (both sides). I’m worried about periodontal issues down the road. What would you recommend? 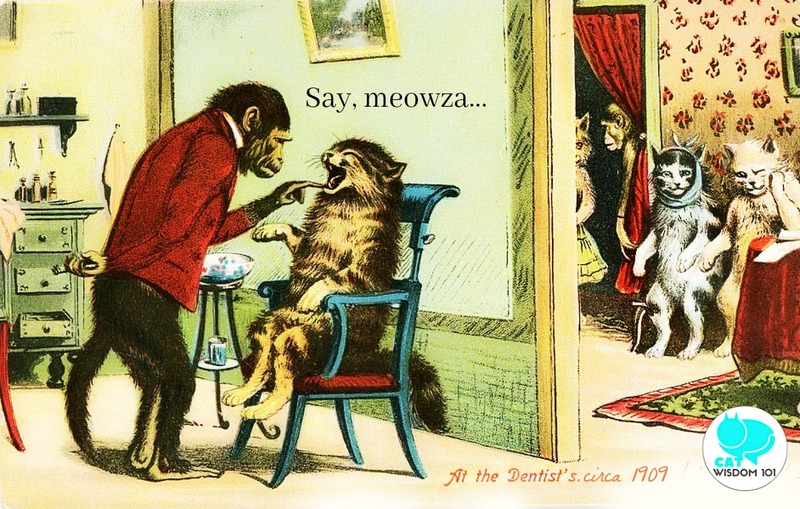 Dentistry for humans or pets has come a long way since this anthropomorphic cartoon from Victorian days. In order for dental cleanings to be done properly in our pets, they must be done under anesthesia. But what if your cat has an underlying health condition that might make anesthesia more risky? In the case of Chips, a heart murmur can be a concern. So let’s look a little closer at that issue. What exactly is a heart murmur? A “murmur” is an abnormal sound that we hear when we listen to the heart with a stethoscope. Normally, the heart should have two sounds: the classic “lub-dub”. But a cat with a heart murmur may sound like “lub-swish-dub”. It means that blood is flowing differently through Chips’ heart, creating an extra sound. Do all murmurs mean there is actually heart disease? No. Typically, murmurs are caused by “leaky” heart valves, or a narrowing or thickening of the chambers of the heart or heart muscle, which can indicate heart disease. But sometimes the position cats are standing in when we listen can affect the sounds we hear. So, listening to a cat’s heart in multiple positions can help us determine if it’s a true murmur, or a “positional” murmur. Also, just like in people, sometimes a murmur can be “innocent”, which means the blood may be flowing differently through the heart, but not because of a diseased heart. Sometimes there can be an abnormality in the heart causing the murmur, but the heart still functions normally. How do we tell the difference? A cardiac “workup”. Any cat with a murmur, especially one that is “suddenly” detected (meaning, on his last exam it was not there, but on this exam, it is there), or a cat that may be undergoing anesthesia, should have the murmur investigated. A typical heart study involves blood work (including thyroid levels), a chest x-ray (looks at the lungs and heart), an EKG (looks at electrical function), and an echo-cardiogram (an ultrasound that looks at the heart from the “inside”). Each of these tests provide a piece of the puzzle so that we can get the entire picture. Once we know the cause of the murmur, we can determine if any medication is indicated to keep the heart healthy, and if the heart is healthy enough for anesthesia. Now, back to Chips. If he does have “heart disease” causing his murmur, does that mean he cannot undergo anesthesia for his dental cleaning? No, as long as his heart is functioning normally (i.e. he is not in “heart failure”). But heart disease does increase the risks associated with anesthesia, which means that extra precautions must be taken to ensure his safety during the procedure and during the post-anesthesia period. Anesthetic drugs and gases can affect the heart’s function. For example, gas anesthesia tends to lower blood pressure and cause “pooling” of blood in the extremities. The heart’s normal response to this would be to try to increase the rate at which it pumps blood to push the blood along. But if you have a weakened heart, you don’t want it to pump faster, because that could make the heart fail. Similarly, some anesthetic drugs cause the release of epinephrine, which will also cause the heart to beat faster. So, selecting an appropriate anesthetic drug protocol to balance all of the potential negative cardiac effects is essential to minimize the stress on the heart. Other precautions include placement of an intravenous catheter so that fluids and medications may be administered – especially emergency medications – should the need arise. Vigilant monitoring of vital signs during and after the procedure is also essential, so that if any difficulties arise, they can be dealt with immediately. So, the first step is to determine the cause of the murmur. If the heart is deemed healthy enough for anesthesia, talk to your vet about the risks and benefits. If your vet is not comfortable with anesthesia for a dental cleaning for Chips, talk to him or her about possible referral to a specialty center for the procedure, or to a cardiologist for recommendations on anesthesia. I am often asked about “anesthesia-free dental cleanings.” Personally, I am not a fan. A large part of proper dental cleanings is cleaning up under the gums, and evaluating each tooth for health, which may include dental x-rays. In order to do the job properly and efficiently, the cat needs to be asleep. The procedure can be done much quicker and more thoroughly that way. Several years ago, I had someone come to do an anesthesia-free dental cleaning on my cat because so many clients were asking about it. After three teeth, the person doing the cleaning hit a tooth that had a cavity. My cat, who was normally the most mellow of cats, jumped out of her arms, let out a blood-curdling scream, and then hid for three days. Excessive dental tartar, gingivitis and periodontal disease can be a big source of health issues for any animal, including animals with heart disease. The balance between risk and benefit for anesthesia is always tricky. But once you have all the information, you can make the best decision to keep Chips in tip top health. For more feline dental tips, check out the advice from Dr. Miller. Much appreciated for the information! Ramon, our 15-year old male black and white DSH just recovered from an abscessed jaw which we think was from a puncture would (cat bite?). He was robust and an outdoor/indoor cat but stopped eating, drinking and looked miserable and had lost weight. Upon an ER exam and after blood work ruled out thyroid diabetes and kidney disease, the Vet’s guess was that he had bad teeth. After I discovered the swollen lower jaw and the puncture wound, he responded well to antibiotics and pain Rx and is back to his old perky self and is eating and drinking again. They discovered a heart murmur and suggested an echocardiogram before subjecting him to anesthesia for teeth cleaning. He has never had his teeth cleaned. I wonder if he has to be anesthetized for the echo. I also wonder if there is an oral product that would dissolve his plaque. I don’t think a bad tooth caused his abscess since I found the puncture wound. This has been so stressful and costly. Any ideas? There are a number of oral dental product for cats which you can Google but we can’t recommend a brand. Some of them work but it means having a cat accept fingers in the mouth to apply. My vet heard a murmur while examining my kitty, Star, in preparation for a dental. We arranged for an echo-cardiogram, which determined the murmur was “innocent.” Star had her dental done, which included pulling three teeth, and she was a much happier cat! Great info on heart murmurs, I learned alot with the very thorough information. Wow, that’s some great information about a common (but hazy) topic. Thank you, Layla! Hope you had fun at the convocation. We missed you! Our kitty groomery uses Plaqclenz to dissolve away plaque and kill bacteria. Its a new product. 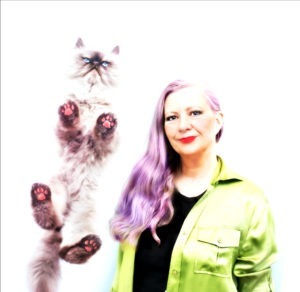 No anaethesia required, just squirt some in the kitty’s mouth. Layla, our mom is going to contact you about those drops. I’d love some feedback on that product. I always love the great information you share with all of us and I always learn so much. Great post! I’m glad I read this. My v-e-t doesn’t want to put me under cos I have asthma and the stress wouldn’t be good. Sooner or later I’ll need to have my teeth cleaned. The peeps used to have a v-e-t who said Autumn had a heart murmur just cos she was purring so hard while they examined her. thanx for de post odin N crew…..we think we iz az scared oh de kitteh dentist as peepulz iz oh de peepulz dentist !!. Timely, since I need to take Derry in for a dental soon, as it’s been 3 years and I know he has tartar on his one or two remaining molars. But I dread the anesthetic, wish some substance could be developed that would clean their teeth (and under gums) topically. That is, just coat the teeth and presto! tartar is gone. That’s assuming there’s no infection or need for tooth-pulling, of course. Thanks for mentioning the need for dental brushing. My 14 year old cat has never needed a dental cleaning his whole life, and I don’t brush his teeth either. I give my cats raw chicken necks about once a week, and all that gnawing scrapes away the tartar and keeps their teeth in excellent condition. Some have called the chicken necks “nature’s toothbrush” and I would have to agree. That is some good information. Sure wish I could afford to have all these cats teeth done. I am very lucky in that my vets work with me with the cat’s teeth. And it is important to have them asleep. I took one kitty to have his teeth clean and all his teeth were totally rotten so they had to be pulled and that could not have been done while he was awake. Our apologies for an earlier tech issue. 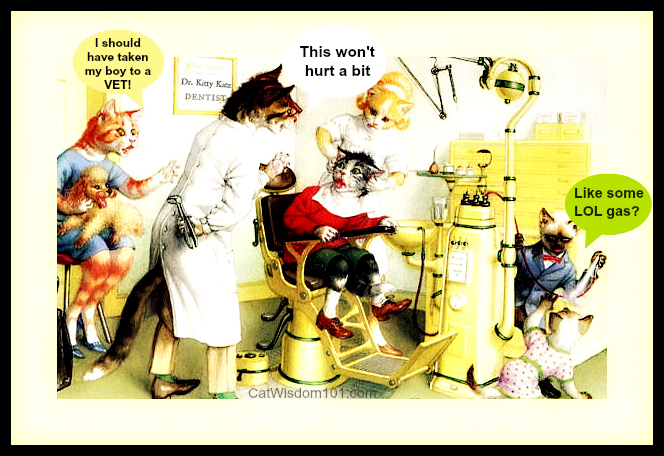 We re-published today’s post with a fun, vintage image of cats at the dentist.